DNV-Containers.com is a brand of TITAN Containers, a Danish registered corporation with global container sale and rental activities. 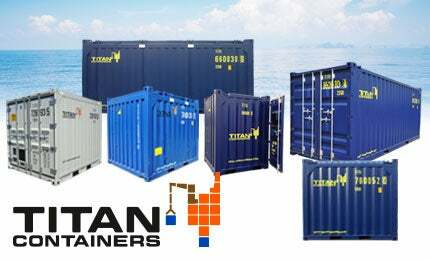 Since 1987, TITAN Containers is a leading supplier of many services, including the sale and rental of many different types of DNV offshore containers. TITAN has developed its rental division and DNV container fleet since 2011 and has invested substantially in new 6ft, 8ft, 10ft, 20ft and 40ft DNV 2.7-1 offshore containers. We have built up extensive knowledge and expertise, allowing us to competitively deliver tailor-made solutions and services worldwide. All our DNV offshore containers are manufactured using the highest quality materials and workmanship, including the latest environmentally friendly technologies. Each and every day, the offshore workforce needs parts, materials and consumables, including food and drink. We supply a range of different sizes from small/mini containers (ccu) through 10ft, 20ft and up to 40ft containers. Reliable accurate temperature control is essential to maintaining food quality and shelf life of all fresh and frozen foods and prepared meals. All TITAN’s refrigerated containers include new technology refrigeration ensure constant precise temperature control from -40°C to 30°C. Additional advantages include in-built data logger, economy mode on chill and other plus temperatures and self-diagnostic programmes. We have worldwide service agreements for refrigeration machines. TITAN has a range of containers permitting loading through the roof where the roof is either, hard top, tarpaulin or net. These types are available in standard 8ft, 6in height and as ½ height containers. Further, we supply containers featuring doors in both ends, doors in the side as well as container frames without doors, walls and roofs. We also provide cylinder (gas bottle) carriers, pipe carriers, skips and other specialized equipment types. All containers are tested and certified in accordance with DN2.7/EN 12079 and are built with user safety, reliability and to withstand operations performed in the harshest environments. For international shipping and transport, TITAN manufactures many types with both DNV and CSC approval. CSC approval permits the easy and low cost shipping on regular container vessels for initial delivery or transfer from one operation area to another. 3ft x 6ft containers and 2ft x 10ft containers are locked together making 1ft x 20ft for easy transports. TITAN is busy getting ready for this summer's many music festivals. Founded in 1987, TITAN's business strategy has and remains providing container rental and sales, together with associate services at affordable prices and with a high level of service. As a regular supplier of DNV containers, we were able to deliver the refrigerated containers ex-stock within days of contractual agreement. Arctic SuperStores were ordered and built and delivered to site within the 12 weeks timeframe. In conjunction with TITAN the customer had built the required point foundations and power supply for the refrigeration machines. On and offshore there are many container types being used by a multitude of suppliers and operators in (and related to) the oil and gas industry. For supply services offshore, we recommend DNV 2.7-1 tested containers for greatly improved sling operations and for more secure health and safety policies. TITAN Containers have entered into a long-term hire agreement with Pepsi Co Research & Development. Australia's first SuperStore has been installed and commissioned in New South Wales. From our most recent DNV production, 10ft and 20ft half-height open tops are ready and waiting at TITAN's factory. The first of a new series of HIAB vehicles will be delivered to TITAN this week. TITAN delivered an Arctic SuperStore to a new customer in Iceland, who is currently using six 40ft HC Standard reefers dating back to 2002.
distributor requiring seasonal chilled storage for the summer. The team is ready, the containers and ArcticStores have started to arrive and 1800 538 572 is now operational! TITAN Containers confirmed its largest single order for 20ft and 40ft Arctic SuperStores. The majority of this order is for committed contracts including to yet another two new 'SuperStore' countries. TITAN New Zealand is a wholly owned subsidiary of TITAN Containers A/S, Denmark. In the coming days, the most recent order for DNV containers will be completed at the factory. TITAN has already delivered many new SuperStore installations in 2015, including three large installations of greater than 200m². TITAN is pleased to introduce multiple language newsletters for our customers and suppliers. TITAN has appointed Spacewise Australia and New Zealand to market its sophisticated range of portable cold stores and refrigerated DNV offshore containers in the region. TITAN Containers has recently released its financial report for 2012, which shows the company achieved business growth of close to 50% compared with the previous year. TITAN is pleased to announce that one of its partners installed a SuperStore 3 in northern Brazil last week. TITAN's latest orders for new standard and DNV reefers were recently completed. TITAN Containers is pleased to announce that it will be exhibiting at the Multimodal 2013 freight transport and logistics exhibition, which will be held at the NEC Birmingham, UK, 23-25 April. The paint is barely dry on the recent order for 160 x DNV 2.7-1/EN 12079-1 containers and TITAN place a new order for a similar number.